The Conference Minister for the Southwest Conference of the United Church of Christ, Rev. Dr. Bill Lyons, has issued the following statement at the Arizona State Capitol regarding the administration’s decision to end the Deferred Action for Childhood Arrivals (DACA) immigration policy. The Southwest Conference United Church of Christ stands in solidarity with and affirms the hopes of our nearly 52,000 DACA-eligible Arizona neighbors, DACA’s 800,000 legal residents, and the 1.9 million DACA-eligible neighbors in America, whose futures in this country are being threatened by the rescission of the Deferred Action for Childhood Arrivals immigration policy. 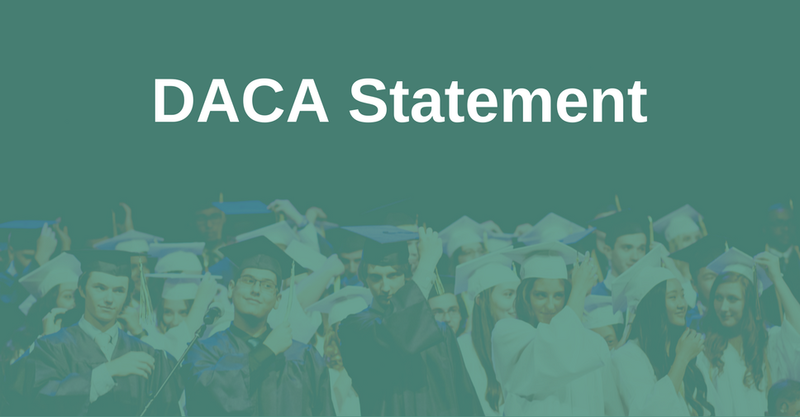 We call on the United States Congress to immediately introduce and pass legislation that permanently guards the protections and opportunities afforded to these hardworking students and workers by DACA. Our calls are consistent with numerous resolutions adopted by the General Synod of the United Church of Christ since 1981. DACA moved between 50,000 and 75,000 immigrants into employment from either outside the formal labor force or unemployment, and increased the average income of immigrants in the bottom of the income distribution. The average DACA participant is 22 years old, employed, and earns about $17 an hour, or roughly $34,000 a year. The majority are still students and 17 percent are pursuing an advanced degree, 91% are employed legally and are paying Social Security and Income taxes. Don’t you believe Attorney General Session’s portraits of ‘the dreamers.’ He was lying to us. When all the surveys and estimates are considered, maintaining DACA would produce an estimated GDP gain of $215-$512 billion and a budgetary impact of $60-$127 billion over the next ten years. Without DACA and the dreamers, America’s problems are staggering. The Center for American Progress and FWD.us, found that repealing the program could cost the U.S. $460.3 billion in economic output over the next decade, and that contributions to programs like Medicare and Social Security could drop by $24.6 billion. But our deepest problems aren’t about economics. I call the President out for his decision’s privilege-driven absence of compassion, but I am not surprised by it. Every voter should have expected this decision given candidate Trump’s campaign rhetoric. Every American should have expected this decision given the administration’s arrest, twenty-five and forty-six days after taking office, of Dreamers Daniel Ramirez Medina and Daniela Vargas. Every person of faith should have expected this decision given the administration’s consistent record of targeting people of non-Christian faith traditions. Every justice-loving person should have expected this decision in the wake of this President’s series of anti-immigration executive orders. Every anti-racism advocate should have expected this decision when Donald Trump sided with white supremacists in the days following Charlottesville. As a faith leader I call you out, Donald Trump, because your track record leading to your DACA decision is a record of moral failures and violations against the dignity of people created in the image of God. I must also question your integrity, Mr. President, when you claim that your decision was based on your duty “to defend the American people and the Constitution of the United States of America.” These words ring false from a President who last week pardoned a former sheriff convicted of systematically violating the constitutional rights of people whom he had a sworn duty to protect. Even so, today I am echoing the President’s call for legislative action. Admittedly, this call upon the United States Congress runs contrary to the track record of its members. They need some calling out too! Nearly all Republicans in the U. S. House of Representatives (along with three Democrats) voted 224-201 to defund DACA in June 2013. In November of 2014 when President Obama tried to expand DACA and create the Deferred Action for Parents of Americans (DAPA) program, Congress could have legislated both programs, but they did not. In December 2014 when 26 states filed suit against both DACA and DAPA, a bipartisan Congress could have passed legislation protecting ‘the Dreamers’ but they did not. In January 2015 when Republicans gained control of both houses of Congress, their leadership could have crafted DACA and DAPA legislation, but they did not. In February 2015, when Judge Andrew S. Hanen issued a preliminary injunction blocking DACA’s expansion and DAPA’s creation, Congress could have acted, but they sat idly by, even when an equally divided (4-4) United States Supreme Court left Judge Hanen’s injunction in place. “In other words, the executive branch, through DACA, deliberately sought to achieve what the legislative branch specifically refused to authorize on multiple occasions,” admitted Attorney General Sessions. So today, members of the House and Senate, I must call you out on your moral failure to pass DACA and DAPA over these last 6 years. Let me ask you, given their track record, why would the President, the Attorney General, or why would we, for that matter, believe that Congress will pass DACA sometime within the next six months? Yet, we are people of faith! And the Bible teaches us that faith without action is dead. This is the time for our faith to launch us into swift, prolonged, won’t-take-no-for-an-answer action on behalf of our 800,000 law-abiding, hardworking, DACA-protected neighbors, and future DACA applicants. This is the time to incarnate the neighborliness and extravagant welcome we proclaim as people of faith through political – yes political – action, because political action the moral, righteous, and faithful response for our ‘Dreamer’ neighbors. There is a story in the Bible about a dreamer. His name was Joseph. In the story, the people who should have protected him, looked out for him and loved him, wanted to murder him because they thought that his special privileges meant they would lose theirs. But cooler heads prevailed, and so rather than murder him outright, they found a whole in which to throw him hoping he would die there. But God wasn’t content to leave the dreamer in a pit. The chance to profit from him arose, and so they sold the dreamer out, and thought that doing so would take care of him and his dreams. But God wasn’t going to let the dreams of the dreamer be sold. In time the dreamer got his education, developed his talents, and found a job. But the privileged people in the house wanted to exploit the dreamer, and when he would not be exploited, they threw him in detention. But God wouldn’t let the dreamer or the dreams be confined. In time the dreamer met another dreamer and together they ruled the land. And then the day came when the dreamer and the ones who wanted to kill both dreamer and dreams met face to face. Beware when you choose to mess with a dreamer. The story doesn’t end well for ones who choose to mess with dreamers. Messing with dreamers can come back to haunt you. Let ones with ears hear what the Spirit is saying to the people. We call on every member of our churches, every voter in our land, to overwhelm every member of the U.S. House of Representatives and of the U.S. Senate with calls, emails, and letters Write, call or email your member of the the US House to immediately sponsor and pass legislation that makes Deferred Action for Childhood Arrivals and Deferred Action for Parents of Americans permanent immigration policy in this country. This is the time to shift the balance of power in Washington, out of the hands of both Democrats and Republicans back into the hands of the American people, to reflect our hope for a united America whose hallmarks are love, peace and inclusion, and the Founders’ vision of liberty and justice for all.